This month I posted 31 entries, listened to 829 songs, watched 3 videos, bookmarked 25 sites, took 1 photo and favorited 4 things. Overall, I've enjoyed the first six years of this millenium. Lots of fun, lots of growth and the Bears are finally good. Unfortunately, there is one huge downside to this decade—the number of zeros. It is clear to all that 200x years contain two zeros. The problem is that this tchotchke-makers everywhere noticed the same thing. 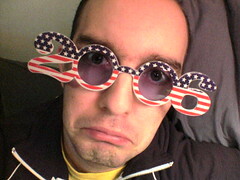 Thus, people all around the country are wearing ridiculous glasses that say "2006" and use the zeros for eye-holes. It makes me cringe. No, it makes me cry. Wait, first I cringe, then I cry and then I lay on the ground in a ball and rock back and forth. It's not pretty. My lovely girlfriend knew this fact and decided to surprise me with a holiday gift. Yes, she bought me a pair of these awful, awful glasses. Happy Chanukkah! Oy. Well, as long as she got them I figure I should at least share my pain with you. Here I am, in all my glory, "enjoying" these as best I can. Feel free to use this to demonstrate the evils of this glasses to your children and your children's children for the remainder of the century. It's now day three of the transit strike. I won't bore you with idle banter about who's at fault and who's not, but I will tell you about how I got to work. Tuesday: I didn't. For day one, I decided to do work from home. I could do that just about every day. Despite the potential distractions, working on my laptop while watching transit strike updates was quite productive. As an added bonus, I got Taco Bell for lunch, something that is relatively difficult in this city. Fast food is definitely awful for you, but it's tough to beat a double-decker taco. Wednesday: As much as I enjoyed the comforts of my apartment, my boss wanted me in the office. Understandable, but disappointing. Being 8 miles from my office, I didn't feel like a 2 hour stroll. So, I opted to ride my bike. Aside from the expected discomfort of riding in 20 degree weather, the ride there was relatively easy. Madison Ave. was closed off to general traffic, so I only had to contend with a few buses and police vehicles. The ride home was far worse. Fifth Ave. had a lane blocked off, but there were tons of people crowding the streets and traffic was awful. The only real positive was the few entertaining cyclists I encountered along the way. Some folks just love to weave. Thursday (today): Even if I could have biked today, I wouldn't have. Instead, I decided to try and hitch hike. A coworker had done it successfully yesterday and I thought it might be fun. So, I made up a sign* (as you can see to the right) and started walking. 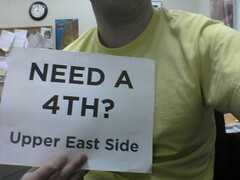 Luckily, before I could even take out my sign I head, "Anyone going to the Upper East Side?" I raised my hand, found out I'd get as far as 3rd and 46th and hopped in the back of his Geo. It was tight, hot and he had on Hot 97, but there was very little traffic and I got to work by 8:45. Mike, Bobby and another unkown were all nice. None of us had much sympathy for the TWU. Tonight I'm staying in Soho and will probably walk downtown a bit (into the next zone) and catch a cab. If anything of interest happens, I'll be sure to share. * Before making my sign, I had read a post on Speak Up about signs with really poor typography. Being a designer, I would have none of that. So, I broke out Gotham, since it was clear, readable and appropriately named. This is my favorite book. I pray it'll be put online somewhere. According to Gothamist, the Ziegfeld will be charging $1.75 extra for tickets to the film adaptation of The Producers. This means movie tickets will be $12.50. Are they crazy? I was planning on seeing the movie there with some friends this weekend, but now that's scrapped. I don't care if the Ziegfeld is the best theater in the city; I'm not paying a premium to see this movie early. Now, I'm not opposed to the concept in general, but if market-based pricing is a two way street. If The Producers is going to be $12.50, then Just Friends should be $4.00 (and that's being generous). On the other hand, if Universal is charging the Ziegfeld so much more to rent The Producers that they have to charge more, then something is wrong with this system. If I bought any snacks in the theater I would be spending close to $20, which is about what I'll pay for the DVD when it's released sometime next spring. I genuinely enjoy going out to the movies, but if prices keep rising I'm going to invest in a big television and say goodbye to my frequent movie watcher cards. Is Ruby on Rails Worth It? Here's a warning: this post will most definitely be nerdy. Ruby on Rails seems to be getting a lot of attention and some really smart companies are getting behind it. Still, the idea of learning a new language seems daunting. I understand that Rails really helps streamline the proccess, but I'd love to see some more documentation as to how this will make my life easier than using PHP. Their screencasts probably are exciting to Ruby developers, but I doubt there are too many out there. Now, you could argue that I looking to jump on this bandwagon and learn it solely because buzzworthy companies have done so, and you'd probably be right as it will likely be marketable to know the technology. But, I really want to see a document showing me what I have to gain, which is why I'm posting this. Does anyone know of some good testimonials from PHP or other non-Ruby developers singing the praises of Ruby on Rails with specific evidence? If so, you'll make my day. If not, I'll just need to dig a little deeper on del.icio.us and Technorati. Music Video for Plan B's "No Good"
This comment made me laugh, then wince, then cry, then laugh again. It's amazing this person is the leader of a nation. Buying TV Shows Online? I'm Not Down. Yet. Everyone's all a flutter about being able to purchase television shows via the iTunes Media Store, but I'm not convinced. I have a few reasons, which I'll outline below, but this article pushed me over the edge. Jeff Zucker, the president of NBC TV, disapproves of Tivo's model for downloads while praising Apple's approach. I'm far from surprised, but why should a consumer be forced to pay for something they've already paid for? As far as I know, I am free to copy and display a TV show in any format so long as it's for my private use. So, what's the problem with bringing them to my PSP? As you might guess, it's because NBC can't make money with Tivo's plan. Thus, I have to pay $2 when I want a copy of my favorite television show. If I weren't already paying for television programming I would be fine with this a la carte system as I'm happy to pick the shows I like and avoid the ones I don't. But buying episodes just to watch on my PSP in addition to paying for a cable plan is far too pricey. In addition, if I can only register one iPod with each copy of iTunes then everyone in my household will have to buy a copy of an episode. This is a larger issue with DRM that deserves its own post, but this kind of nickel and diming will never win me over. We're paying for convenience here. That's why I spent $25 on the 3rd season of Home Movies—buying a DVD set is easier than recording each episode and copying it to disc myself. But if I can download episodes from my Tivo, send them to my computer and watch them on a variety of devices at will then what incentive will I have to download episodes for $2 each? Today, I have no incentive. When every program, from network to cable, is distributed online* I will buy in, assuming the DRM schemes are reasonable. Then I will ditch my cable subscription and buy my shows online. Until then, I can wait. * This reminds me that set-top boxes are going to be a huge deal in the next few years. It also makes me believe we will indeed get a digital hub Mac Mini this January. Despite being a picky eater, I now want to go. I can't believe I'm just hearing about this. It seems like a bunch of people I know keep winning prizes. It's my new search engine. My sister got me hooked on this game. Anagrams rock. Perfect Moments in Pop: Ben Folds Five's "Army"
After posting about Russell's, I happened to notice that the very first post to this blog occurred on December 1st, 2000. Therefore, Capn Design is officially five years old. * Man, how things have changed. Just take a look at the December 2000 archive if you need any proof. It's entertaining for me, at least. In honor of this birthday, I fixed the rotating images that had been broken for a month. Also, once I finish up a couple freelance projects, this whole site will get an overhaul. For at least the last three years, I 've just been putting code on top of code. It's time to start fresh. Hopefully all will be ready in time for January 1st, but 5 years of this has taught me that hitting design deadlines for a blog is less likely than being cast as Michael Jordan in the sequel to Space Jam. * I've been journaling online in some form or another since September of 1999, but the word blog would have meant nothing to me then. Also, those archives are either lost or buried somewhere on an old machine in my storage locker. Like most people, I have a variety of traditions to attend to each time I go home. The best ones involve seeing my friends and family, but my favorite restaurants are next in line. 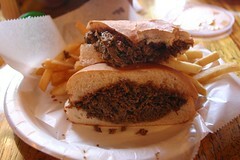 For lunch, I hope to get a sandwich from Potbelly Sandwich Works. I highly recommend the Wreck. If I'm craving sushi, we go to Sushi Kushi Toyo in Lake Forest. When I'm near my dad's work or grandma's house, I love hitting up Russell's Barbecue in Elmwood Park. To be clear, I don't go to Russell's for ribs or chicken, I go for their BBQ sandwiches and that is all. Their other stuff is probably good, but it's of no use to me. These sandwiches are delicous. Come to think of it, their barbecue sauce is what's really delicious. Yes, the meat is tender and shredded, perfect for soaking up liquids, but I come back to spread that sauce all over the sandwich. Russell's is definitely an institution. It's been around for 70 years and it's the kind of place your parents or grandparents introduce to you. If you don't have either in Chicago, you can go anyway. I recommend splitting three sandwiches between two people because I just can't leave having eaten only one sandwich.